Before anything else, I would just like to remind all those who join to activate/verify your subscription from the EMAIL that was sent to you by feed burner. Just click the link provided in the mail. 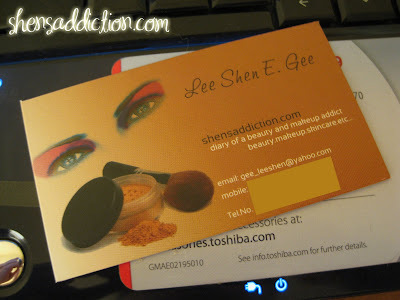 Two wise beauty blogger once told me that I should have a business card for my blog. Thanks to beautynomist and her sister C, they made it possible. My business card (both for blogging and business/work) came earlier than expected! C captured my thought exactly even if we only communicated over the phone, emails and text. Thanks to S, she suggested the base color of brown which for me is an elegant color. Thanks to S, C and the rest of Megaluck Prints for this! Hope to do business with you again... and soon!! Don't forget to join my CONTEST.